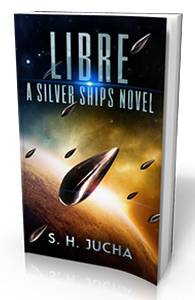 The saga of the Rêveur continues in this second novel in The Silver Ships series. The surviving Méridiens have returned to Confederation space, aided by their recently discovered cousins, the New Terrans. They expect a celebration after their 71-year absence. Instead, they’re shocked to find the silver ships have destroyed half the Confederation. The Méridiens are fleeing in advance of the horde of alien ships. But Alex Racine and his crew didn’t come this far to run away from humanity’s enemy. They intend to hunt the silver ships. But, to succeed, they need help. Renée de Guirnon, the leader of the Rêveur’s Méridiens, reveals a sordid secret of Méridien society: citizens who defy their House, for any reason, are stripped of their rights, declared “Independents,” and imprisoned on the planet Libre. But the Independents aren’t everyone’s pariahs, especially if you’re Alex Racine and you’re looking for allies against the silver ships. An entire colony of independent, free-thinking radicals offers just the sort of people Alex wants on his side, and an alliance is struck.